Guess what: the law of diminishing returns applies to bags of dried squid! Last year, I drove a Craigslist Rideshare from Seattle to Denver. He offered me a weird snack: dried squid. I tried some. It was surprisingly delicious! This year, I wanted some more, but I couldn't find them in Austin. Fortunately, I was super psyched to find them on Amazon.com. 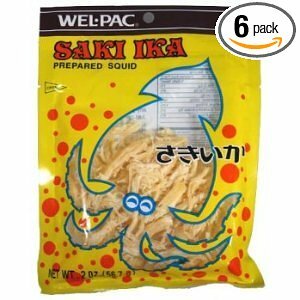 I ordered a 6 pack of Wel Pak, Saki Ika dried squid. I really enjoyed eating the 1st squid bag. I kind of enjoyed eating the 2nd squid bag. However, by the time I got to the 3rd squid bag, I was sick of them. Now I have 3.5 more gross squid bags that I do not want to eat. Has this ever happened to you? I hope not. I now have 3.5 bags of nasty snacks to give to the homeless. Also, Christmas is coming. I haven't bought my new wife any presents yet- or have I?